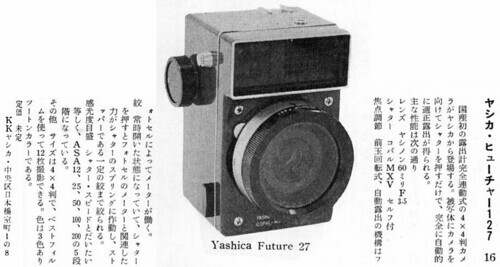 The Yashica Future 127 (ヤシカ・フューチャー127) is a 4×4cm prototype camera with automated exposure, announced by Yashica in 1959. It was the first Japanese camera with auto-exposure, a feature called "Electric Eye" at the time. In 1957, the release of the 4×4cm Baby Rolleiflex and that of various 4×4cm Brownie cameras caused a brief upsurge of interest for this format. Various Japanese 4×4cm TLRs followed, including the Yashica-44 released in 1958. 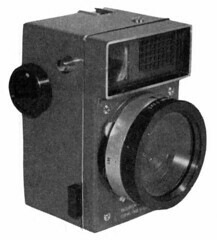 In 1958–59, a trio of American 4×4cm auto-exposure cameras was released in quick succession: the Bell & Howell Electric Eye 127, Revere Eye-Matic EE 127 and Kodak Brownie Starmatic. These were among the first popular cameras with automatic exposure, after Agfa's expensive Automatic 66. 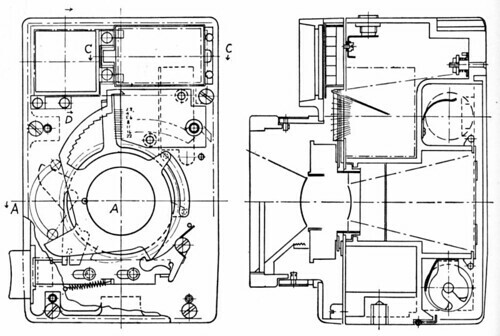 At the period, the 4×4cm camera boom was already coming to an end, and both the Yashica and Olympus were shelved. The experience gained with the Future 127 was used for later Yashica 35mm auto-exposure models, such as the 1961 Flash-O-Set and 1962 Yashica 35EE. 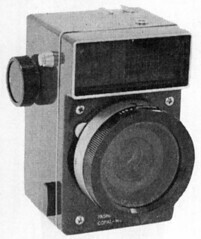 The camera's development was started in February 1958. The body shape was designed by Someha Keiichi (染葉桂一), and the internals were designed by Takahama Sachi (高浜祥) of the Konan Camera Laboratory. It is said that the camera was thought from the start for display in the American press or photography shows, rather than as a commercial product, and this is why it was designed so that it would be easy to assemble a handmade prototype. A single functional example of the Future 127 was made, followed by a mock-up for further research. The final design was submitted by Someha on January 20, 1959, with a two-tone finish which was not applied on the prototype for lack of time. It is said that the camera was finished on March 6 in the morning, for a presentation on March 7, presumably to the Japanese press. The Future 127 was displayed in the 35th annual convention of the Master Photo Dealers and Finishers’ Association (ancestor of the PMA), held in Philadelphia in March 1959. It was featured in Japanese magazines dated April and May 1959, certainly after the March 7 presentation. The May issue of Shashin Kōgyō announced the camera in two-tone finish, in three different colours. A detailed article by a member of the Yashica company also appeared in the June issue of the same magazine. The body has a vertically elongated boxy shape. It seems that it was designed to be used indifferently in the vertical or horizontal position. The dimensions are 80mm length, 123mm height and 98mm thickness, and the weight is 900g. The film travels vertically, as on TLR cameras, and is advanced by a knob on the photographer's right. The L-shaped back is hinged to the bottom for film loading. The film advance is manually controlled via a red window. The company certainly wanted to keep the prototype simple and concentrate on the exposure system, hence the absence of an automatic advance. The viewfinder is contained inside the body, at the top right. It has no bright frame, but contains a prism showing the position of the meter needle. The grid for the selenium cell is placed next to the viewfinder window. The two are covered by a common sheet glass, circled by a protruding frame, to avoid the user involuntarily putting his hand in front of the meter cell, notably when the camera is held horizontally. The main release is placed on the right-hand side, at the bottom, as on some TLR cameras; it naturally falls under the user's right index when the camera is held horizontally. There is an accessory shoe at the top, towards the rear left. A small hole is visible in front of it, certainly containing a flash synch post. Strap attachments are placed on both sides of the body. There are apparent cruciform screws on the corners of the front plate (a voluntary design feature). The lens and shutter are contained in a cylindrical barrel, protected by a fixed UV filter at the front. The lens is a three-element Yashinon 60/3.5. A black focus ring surrounds the front part of the barrel, moving the lens front cell only. The distance scale is engraved in feet, from ∞ to 3.5ft, set by visual estimation. The absence of a rangefinder is certainly explained by the same reasons as that of automatic advance: to keep the prototype relatively inexpensive and easy to make. Other controls are behind the focus ring. There is an M/X selector for flash synchronization and a self-timer lever on the left, and the shutter cocking lever is on the right. The sensitivity index is at the bottom, and moves along a scale graduated in ASA with B, 12, 25, 50, 100, 200 positions. The index actually turns the speed ring of the Copal shutter contained inside the lens barrel, and each sensitivity setting corresponds to a fixed shutter speed, from 1/500 at ASA 200 to 1/30 at ASA 12. 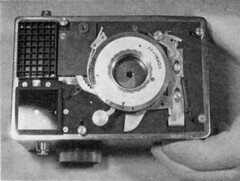 Various documents report the shutter name as "Copal MXV", but pictures of the inside of both the functional camera and research mock-up show the name COPAL–SV instead. The diaphragm is electro-mechanically controlled by the exposure meter. When the release button is pressed, the spring-loaded diaphragm ring is released until a stair-like part gets blocked by the meter needle. Then the button trips the shutter at the end of its course. When the light is insufficient, the meter needle visible in the viewfinder gets into the red, but it seems that the shutter doesn't get blocked. After the exposure, the meter needle is freed and the diaphragm ring is reloaded when the shutter is wound for the next picture. Both the functional camera and the research mock-up survived, and have been pictured in historical publications. All the available photographs are black and white, and the camera's colours are unknown. 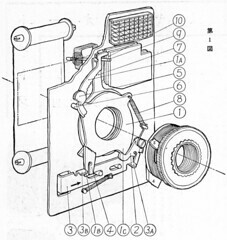 The functional camera appears in the original documents and in an article by Shirai Tatsuo in Camera Review, dated May 1979. It corresponds to the above description. No marking is visible on the top plate. In the original pictures, the lens and shutter names appear on the front plate, under the barrel, and a serial number and the word JAPAN appear on the rear, behind the accessory shoe. It seems that these markings were erased when the camera was examined by Shirai in 1979. It also seems that the strap attachments were altered between the original pictures and those by Shirai. The mock-up is known from two relatively recent pictures, and was certainly not presented to the press in 1959. Its front plate and lens barrel are incomplete, and it notably lacks the focus ring. It looks like the front plate was made to receive a leather covering. The shiny cruciform screws are replaced by ordinary screw on three corners, and the fourth corner, under the selenium cell, has a shiny disc whose use is unknown. The advance knob differs from that of the other camera, and the strap attachments are the same as on the 1959 pictures. The mock-up has the company name YASHICA inscribed on the top plate, perhaps together with a model name; no other marking is visible. ↑ Shirai, p.59 of Maboroshi no kamera o otte. ↑ 2.0 2.1 Shirai, p.61 of Maboroshi no kamera o otte. ↑ 3.0 3.1 Shirai, p.62 of Maboroshi no kamera o otte. ↑ Shirai, p.58 of Maboroshi no kamera o otte. ↑ 5.0 5.1 5.2 5.3 5.4 Someha, p.37 of Kōgei News July 1959. ↑ Shirai, p.66 of Maboroshi no kamera o otte. Details of the show are found in the May 1959 issue of Shashin Kōgyō. ↑ Kokusan kamera no rekishi, p.410, and Shirai, p.59 of Maboroshi no kamera o otte. ↑ 8.0 8.1 8.2 Column in Shashin Kōgyō May 1959, p.571. ↑ Ino, pp.603–5 of Shashin Kōgyō June 1959. ↑ The picture in Someha, p.37 of Kōgei News July 1959, shows the camera held in the horizontal position. ↑ 11.0 11.1 11.2 Ino, p.603 of Shashin Kōgyō June 1959. ↑ 12.0 12.1 Shirai, p.57 of Maboroshi no kamera o otte. ↑ 13.0 13.1 Shirai, p.65 of Maboroshi no kamera o otte. ↑ Picture in Ino, p.604 of Shashin Kōgyō June 1959. ↑ Picture in Ino, p.603 of Shashin Kōgyō June 1959. ↑ Picture in Shirai, p.64 of Maboroshi no kamera o otte. ↑ 17.0 17.1 Details in Ino, pp.604–5 of Shashin Kōgyō June 1959, and in Shirai, p.63 of Maboroshi no kamera o otte. ↑ Ino, p.605 of Shashin Kōgyō June 1959. ↑ Pictures in Shashin Kōgyō May 1959, p.571, in Ino, pp.603–4 of Shashin Kōgyō June 1959, and in Someha, pp.36–7 of Kōgei News July 1959. ↑ Pictures in Shirai, pp.57 and 64–5 of Maboroshi no kamera o otte. ↑ Example pictured in Shirai, p.64 (right) of Maboroshi no kamera o otte, and in Shibano, p.10 of Kurashikku Kamera Senka no.26. Ino Kisaburō (猪野喜三郎), from the Yashica company. "Yashika Fyūchā 127 to Erekutorikku Ai kamera" (ヤシカ・フューチャー127とエレクトリック・アイ・カメラ, The Yashica Future 127 and Electric Eye cameras). In Shashin Kōgyō no.86, June 1959. Pp.603–5. Shashin Kōgyō no.85, May 1959. "News Flash". P.571. Someha Keiichi (染葉桂一), from Yashica's project department (㈱ヤシカ企画部). "IAN Spotlight: Yashica Future 127" (IANスポットライト・ヤシカ・フチュア127). Article in Kōgei News vol.27 no.4, July 1959. Pp.36–7. Available in pdf version in the AIST Tohoku website. Asahi Camera (アサヒカメラ) editorial staff. 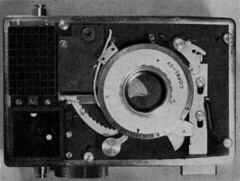 Shōwa 10–40nen kōkoku ni miru kokusan kamera no rekishi (昭和10–40年広告にみる国産カメラの歴史, Japanese camera history as seen in advertisements, 1935–1965). Tokyo: Asahi Shinbunsha, 1994. ISBN 4-02-330312-7. Item 1710. Shibano Daisuke (柴野大輔). "Tasai ni tenkai suru mittsu no burando: Yashika, Kontakkusu, Kyōsera no kamera" (多彩に展開する三つのブランド・ヤシカ、コンタックス、京セラのカメラ, Three brands developing in various ways: Yashica, Contax and Kyocera). In Kamera Rebyū: Kurashikku Kamera Senka (カメラレビュー クラシックカメラ専科) / Camera Review: All about Historical Cameras no.26, September 1993. No ISBN number. Yashika Kyōsera Kontakkusu no subete (ヤシカ・京セラ・コンタックスのすべて, special issue on Yashica, Kyocera and Contax). Pp.8–11. The Future 127 is not listed in Sugiyama. This page was last edited on 25 January 2019, at 11:41.